20 year old Simon Reid has inherited his famous father Brian’s love of speed. Reid senior was a double Formula Two world champion on the roads in 1985 and ’86 and now Simon will follow in his wheeltracks on thevisorshop.com ER6 Kawasaki in this year’s Ulster and Irish Supertwins short circuit championship. The former schoolboy Ulster and Irish motocross champion competed in the 2015 BMX Freestyle world series before being turning his attention to tarmac racing. “Racing is in the blood and nothing puts a smile on my face like riding a motorbike.” Reid said as he announced his 2017 plans at the NI Motorcycle Festival at the weekend. Never having raced on tarmac before, the novice is realistic about his goals. “I need to learn and build confidence.” he said. That news will help calm his father’s nerves. “I am nervous about Simon going racing but he had a great talent in motocross and hopefully he can convert that across to tarmac racing.” Brian said. 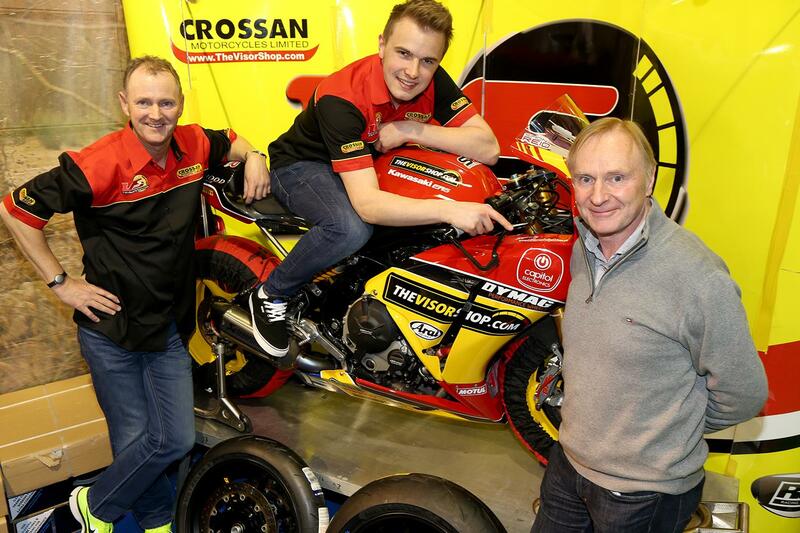 “Simon will make his debut at Bishopscourt at Easter.” new sponsor Adrian Fegan of Crossan Motorcycles explained.